Monsignor Ronald Knox was a man of many talents. In addition to being a Catholic priest, he was a writer, broadcaster, scholar, Bible translator and theologian. Knox broadcast his thoughts about Christianity, Catholicism, history, and other subjects for several years on British radio. Before Orson Welles "War of the Worlds", Knox is believed to have perpetrated the first radio hoax though, like Welles, it was not intended to be a hoax but a performance. The show, titled "Broadcasting from the Barricades", seemed very real as Knox interrupted a band performance from the Savoy Hotel with reports of a revolution in London. Interviews with people on the streets, lynchings of government officials and reports of bombings made the broadcast seem very real. Compounded by a snow storm that kept the newspapers from being delivered, the broadcast along with the lack of real news caused a minor panic. Knox was born into a devout Anglican family (his father was Bishop of Manchester) and he, too, was ordained into the Anglican church as a priest. He was later appointed chaplain of Trinity College. Sometime between his ordination in 1912 and 1917, Knox experienced a conversion to the Catholic faith and was ordained a Catholic priest in 1918. Knox was an interesting man with fingers in many pies from translating religious texts to writing detective fiction. All of this wrapped up in a priest's collar. This collection contains religious sermons. 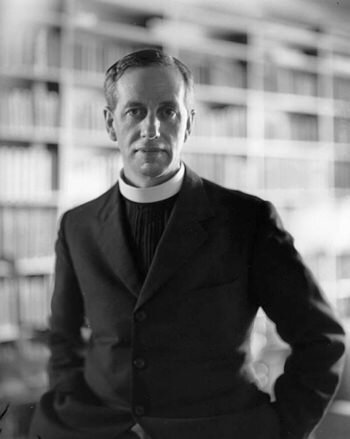 Be the first to comment on "Ronald Knox"